For users willing to be guinea pigs, Dropbox is offering an opportunity to score 5GB of free space through the popular cloud storage service. PCWorld is reporting the 5GB is actually in addition to the standard 2GB issued to free users, making the possible total for free Dropbox users a roomy 7GB. Some of you may also be interested to know that Microsoft's Skydrive is still offering 25GB of cloud storage. Despite the enormous amount of storage space Skydrive offers, limits imposed on the service have made it unappealing for many. Microsoft claims it's working on alleviating those concerns though, for what it is worth. While the 5GB of additional space is technically free, there are a few conditions that must be met in order to qualify. Here's how it works. 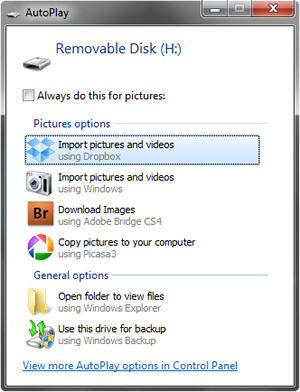 Next, users must utilize Dropbox's new automatic photo import feature to upload photos (see notes below). This beta feature is actually the reason for the promotion, as the Dropbox team is working to stamp out the bugs associated with it. On your first automatic photo import -- any amount of photos will do -- Dropbox will give you an additional 500MB of free storage space. For every 500MB of photos you upload afterward, Dropbox will add an additional 500MB to your account for a total maximum of 5GB of added storage space. This amount is added atop the standard 2GB that free users already enjoy, so keep uploading photos and you'll have a healthy 7GB of free Dropbox storage. Reportedly, the additional space you get from participating in the beta is permanent. However, if you would prefer to use your extra 5GB for something other than photos, you can simply delete them once you've claimed your new storage space. After the photos are gone, you are free to use the extra capacity however you would like. Dropbox also offers up to 8GB of free space through its referral program. There is no word on whether or not this storage space will stack with the beta offer. Clients 1.3.5 and earlier had an auto-update bug. Please install this version so that your client will stay up to date! The photo import feature is not available on Mac 10.4 and Linux. For Android devices, it's best to use "Connect as Disk Drive". HTC Sync will not work. To import from iPhone, make sure to unlock your phone and enter your passcode before importing, otherwise it will claim to find no photos. If importing from your iPhone on Mac gives an import error, try hard resetting it--hold down the power and the home button for 5 seconds. This will reboot the phone; it shouldn't change your settings or delete data. On Windows, this feature relies on Autoplay. Please enable Autoplay to use this feature if you have disabled it. On XP and Vista, it relies on the Windows Image Acquisition Service. If this service is not started, please start the service and reinstall Dropbox to use this feature. On Windows Server, you may have to install the Desktop Experience feature. On Windows 7, newer devices that rely on Device Stage (in the Control Panel) will not show Dropbox as an import option until you select "Change Program" for the default. The Galaxy Nexus takes a lot of time to connect on OS X because it likes to pretend that every image on the device is a photograph. We now estimate how long it's going to take and show you that in the progress bar but it's usually in the order of minutes. We're working to see if this can be improved.